UV Glass minimises fading of the signature, print or fabric over time and preserves the value of the memorabilia. (UV Glass prevents 97% UV light entering the display). Most people select the UV Glass Framing Option to preserve their valuable memorabilia displays. 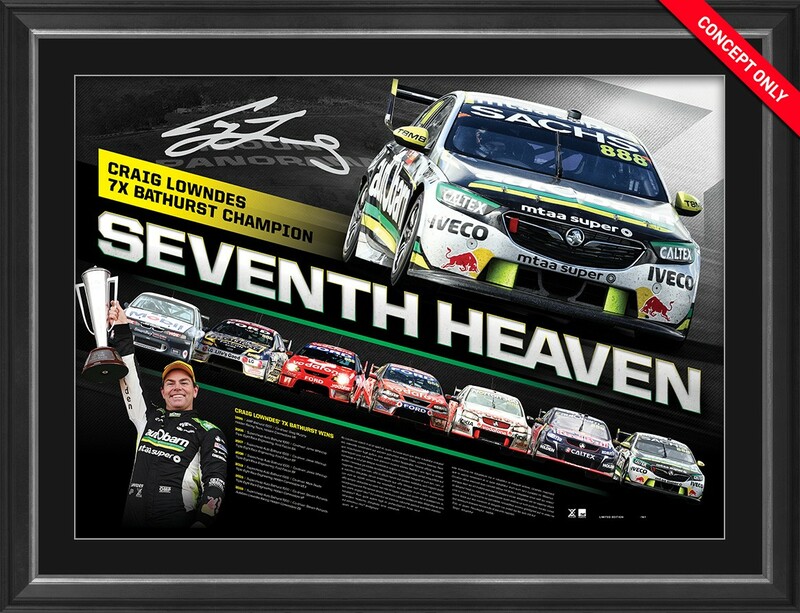 'Seventh Heaven' is limited to just 161 editions worldwide, 'Seventh Heaven' comes personally signed by retiring Motorsport legend Craig Lowndes and features iconic imagery from his incredible seven Bathurst championships. This magnificent piece is a must have for any Craig Lowndes fan or Motorsport enthusiast alike - secure yours before stock runs out! What a fitting way to farewell Bathurst, with an incredible seventh victory for the Legendary Craig Lowndes! As sports fans, we all want excellence from our favourite players, teams and clubs. Why should we expect anything less than perfection for our sports memorabilia? Not all memorabilia is the same… Champions sell athlete endorsed memorabilia. Whether you are looking for a modern day limited edition or a game-worn item, you can be sure that you are buying the genuine article. Our licensed pieces are authenticated by a reputable third party, licensed by the appropriate Sports Authority and come with a Certificate of Authenticity. Champions understand the thrill that comes from touching history. That is why we specialise in supplying unique pieces of sports memorabilia for even the most discerning fan. 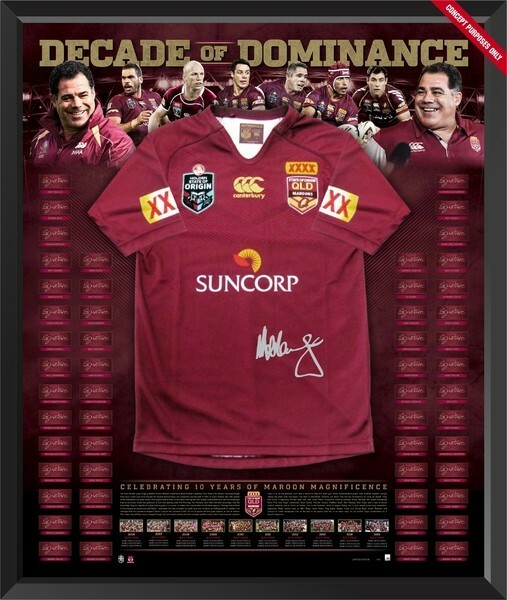 Discover why Champions are Australia's Leading Experts in Memorabilia and Jersey Framing. Champions provide our clients with two framing options - standard framing which is similar to what you will see elsewhere and Champions quality framing which includes a higher quality of acid-free framing materials, UV Clear glass (to minimise the fading of your memorabilia and signatures) and conservation mounting techniques (such as jersey hand stitching). This is the best framing method for preserving your memorabilia in the long term and retaining its value. 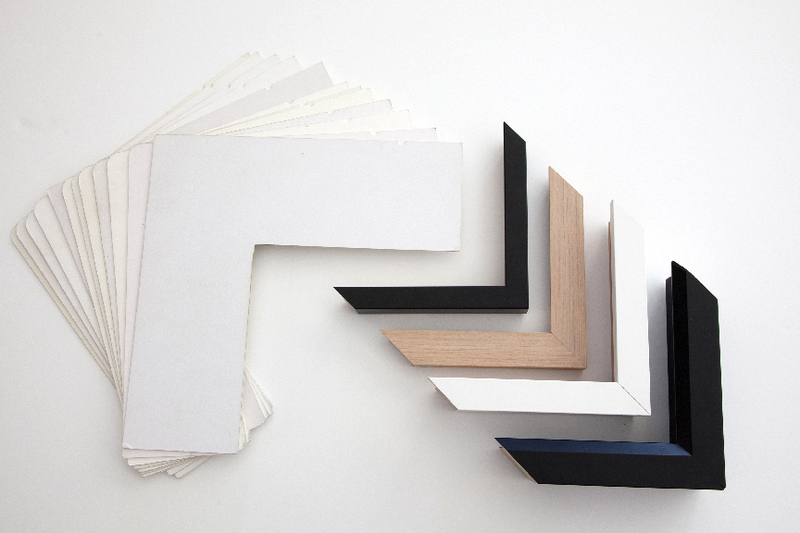 Champions Quality Framing is selected by the majority of our clients. sportsperson’s management or directly from the sports team or sportsperson themselves. memorabilia investment of every Champions customer. the sportsperson and the Code or Authority which governs that particular sporting code i.e. Champions take pride in everything we do, right down to the protection of your memorabilia item during transportation. A custom designed timber crate (not a cardboard box) is constructed for your display during the transport phase of your order to ensure that all possible care is taken to ensure your fragile item is received in perfect condition. Shipments and deliveries only occur on weekdays and require a signature upon delivery.Champions will contact you prior to shipping.Delivery times are not guaranteed, but are our best approximation. The driver will hand over the package to you in person. If you (or a representative) are not at the delivery address at the time of delivery, your item will be held at your closest TNT depot and re-delivered on a day suitable to you. Champions offer flat rate shipping throughout Australia. Additional charges may accrue if you request Priority, Overnight, Remote Area and International shipping. Please contact Champions on 07 3397 4331 if you require these shipping services and we can provide you with a quote. You should receive your item is perfect condition. In the rare occurrence of damaged goods, Champions customer service team must be contacted within 5 days of item receipt. A refund, repair or replacement item will be issued if an item is received damaged, as well as full coverage of return shipping costs and shipping costs of the new item if applicable. (A refund or store credit will be provided if the item is not able to be replaced or repaired). Secure your limited edition memorabilia before it sells out. Champions offer a three month interest-free lay by on this product – which comprises a 25% deposit paid today and three equal credit card payments for the next three months. Please contact Champions on 07 3397 4331 to set up your lay by payment plan today. SOLD OUT! 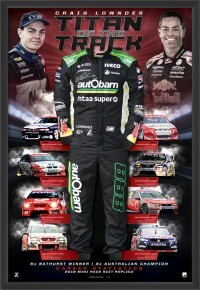 Craig Lowndes Signed "Titan of the Track"